After an impressive rally off its lows for Netflix (NASDAQ:NFLX), it helped lead tech out of an early rout on Tuesday. Unsurprisingly, that gave a big boost to stocks on the day. Any surprise we’re starting with Netflix as our first trade? After slipping as much as 14% after it reported a disappointing second-quarter earnings report, NFLX stock quickly erased a majority of those losses. Shortly after the report, we wrote that support could come into play between $335 and $340, a prior breakout level. 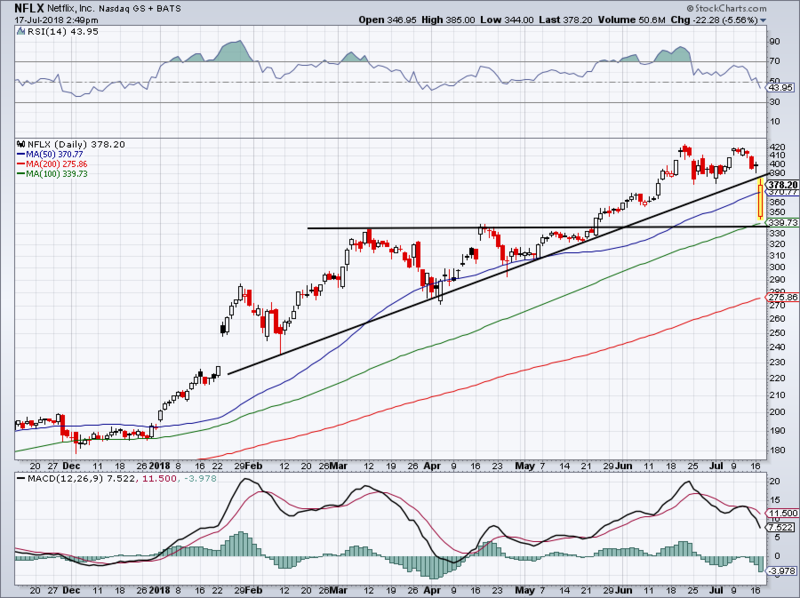 That range held as early support, as NFLX has vaulted back above its 50-day moving average. So where to from here? After some pretty ugly subscriber growth numbers for this quarter and poor guidance for next quarter, it’s hard to imagine NFLX maintain much strength. I get buying a secular winner like NFLX on the dip. But gobbling it up and erasing its losses in just a few sessions seems unwarranted given the results. Back above trend-line support and new bulls can make a case for getting long. Those who took a long position in the name on Tuesday should watch today’s lows. Below that mark and under support would be bad news for Netflix. Johnson & Johnson (NYSE:JNJ) beat on earnings per share and revenue expectations Tuesday morning, sending shares higher. On Friday we pointed out how well its stock was reacting despite it paying a large settlement. 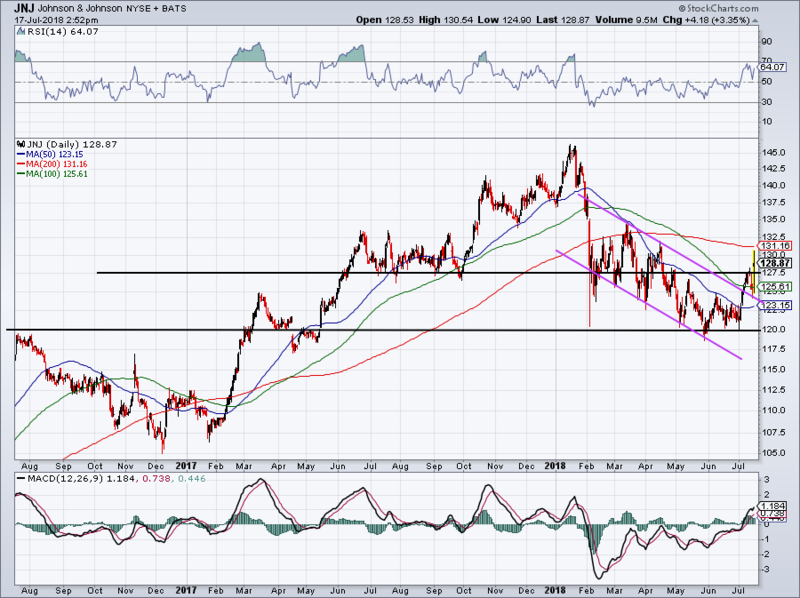 During that analysis, we said JNJ needs hold up above its prior downtrend channel (purple line) and it would be preferable for shares to get back above $127. Well, the stock was able to after it reported earnings. If it can push through its 200-day moving average, JNJ could be heading to $135. Ulta Beauty (NASDAQ:ULTA) once could do no wrong. Same-store sales were blistering and Wall Street cheered the name with a passion. That story — as it usually does — ended as expectations got too high. However, Ulta has been rebounding hard since March. The stock has been putting in a series of higher lows, as seen by its trend-line of support (pink line). The $255 to $260 area is clearly resistance. Should Ulta pullback, look for support to come into play around $245, or perhaps a bit lower with trend-line support nearby. 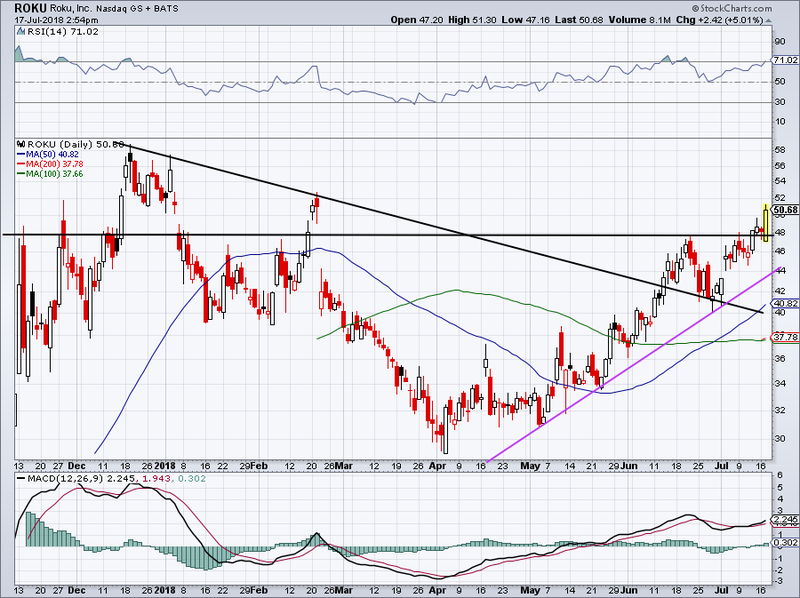 If that plan develops, Ulta is presenting us with a low-risk buying opportunity. We flagged the hot trade in Roku (NASDAQ:ROKU) one month ago and it’s performed better than we could have imagined. Shares burst through downtrend resistance, hit $48 resistance and then pulled back into trend-line support and the backside of downtrend resistance. But that’s not all. Support held and sent ROKU back to $48 resistance, where shares promptly pushed through. With a bullish outside day on Tuesday, shares look great right now. That is, for those who have been long. What if you haven’t? Wait to see if and when ROKU stock pulls back to $48. If this level holds as support, investors can go long. If this level fails, wait to see how it does near trend-line support (pink line). BlackBerry (NYSE:BB) hasn’t been trading all that well. 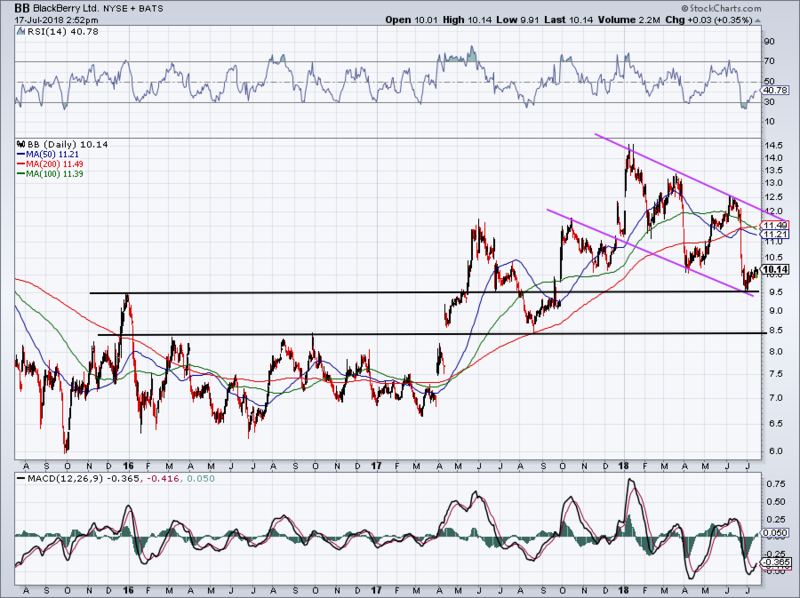 It’s trapped in a downtrend channel and if the $9.50 level fails, it will be in trouble. So where to from here? Currently trading at $10.15, a rally of $1 or more isn’t out of the cards. That will bring BB back to all three major moving averages, along with the resistance line of its downtrend channel. If that were to be the case, I would likely look at a short position in BlackBerry. Bulls who are buying now or want to buy need to keep an eye on $9.50. If this level gives way, the $8.50-ish level would be the next line in the sand for me. 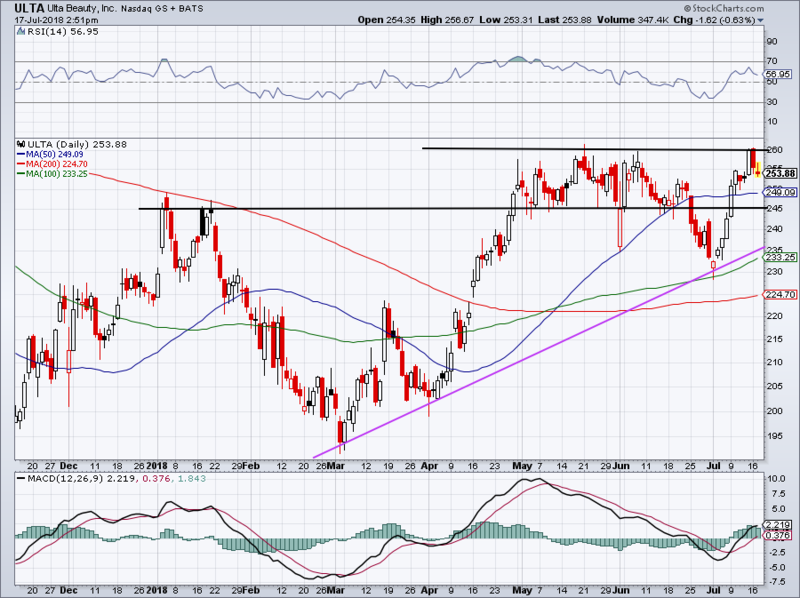 On a close below $9.50, I would also consider BB an attractive risk/reward short candidate. Currently, there are a lot more attractive long candidates out there than BB though. Bret Kenwell is the manager and author of Future Blue Chips and is on Twitter @BretKenwell. As of this writing, Bret Kenwell was long ROKU and JNJ. 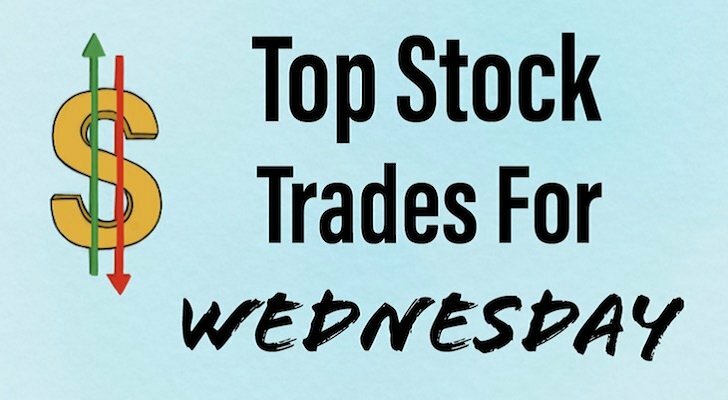 Article printed from InvestorPlace Media, https://investorplace.com/2018/07/5-top-stock-trades-for-wednesday-nflx-jnj-ulta-roku-bb/.